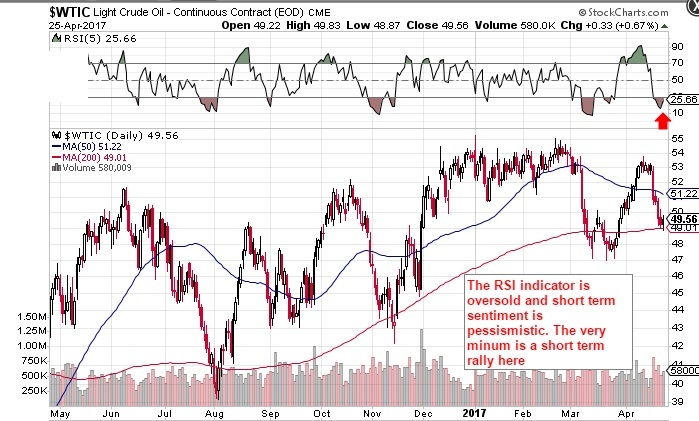 From a cycle standpoint, crude oil remains very difficult to read at present. Although sentiment and momentum indicators looks pretty oversold at present on a short term basis, I still am unsure if we printed an intermediate low in March or one still lies ahead of us. Presently the commodity is definitely due a bounce especially with equities powering forward over the past few trading days. If you are going play oil at present, probably the best play is to place a hard stop just below the recent lows just in case an intermediate low still lies ahead of us. What is definitely bullish is that the energy stocks (NYSEARCA:XLE) have rallied along with equities over the past few days. 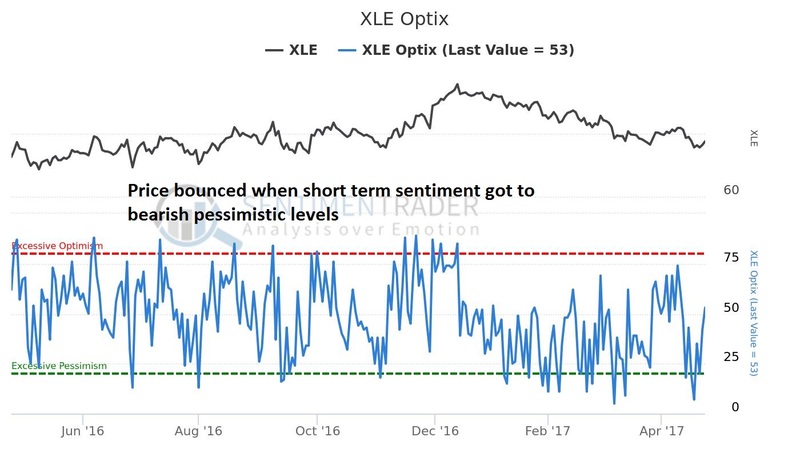 The (NYSEARCA:XLE) ETF definitely looks like it has printed an intermediate bottom as its decline since December of last year has been steep to say the least. Sometimes both miners in the metals sector and energy stocks in the energy sector can bottom before the actual commodities. Are we getting the same setup here? 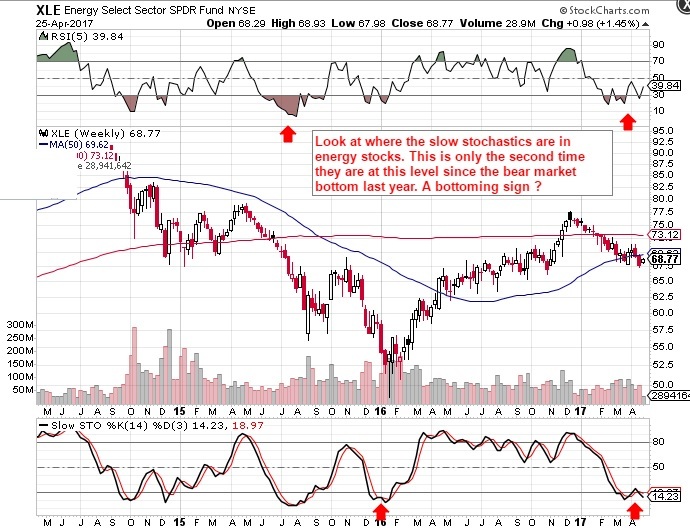 Let’s investigate this one..
Look at where the slow stochastics are in energy stocks. This is only the second time they are at this level since the bear market bottom last year. A bottoming sign ? Therefore if oil has bottomed, it means that the lows in March was indeed an intermediate degree low. Long term sentiment in oil just didn’t get to similar levels in August and November of last year. Now this may be completely normal. The bear market oil suffered for half of 2014 and 2015 was cruel to say the least and sentiment readings illustrated this. If we indeed print an intermediate low in March, we either have a daily cycle or half cycle low with us at present. Furthermore the March lows should hold which means downside risk could be limited. If this is a brand new intermediate cycle, we are now in the fourth week which would have meant the last intermediate cycle would have been around the 19 week mark. This is definitely short for an intermediate cycle and usually means that the next cycle would go longer than the standard 25 weeks. 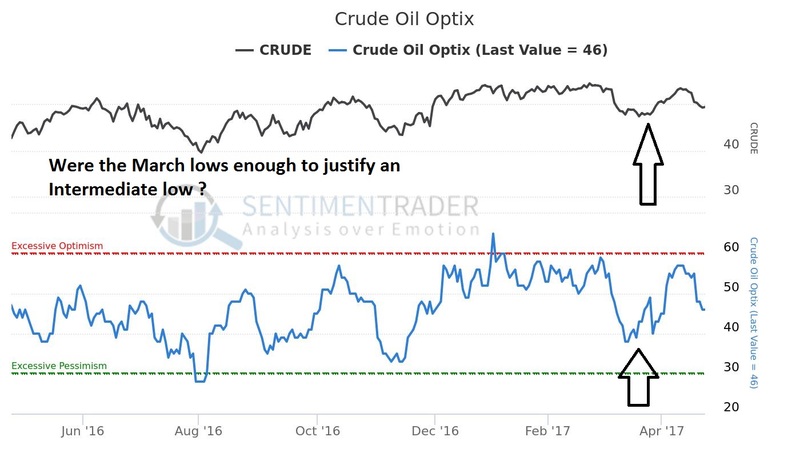 The good news is that although sentiment has not dropped to levels we saw last month, the recent decline in the price of crude means that the March stop is only about $2 away. So what is the best way to play this move? One could easily go long the likes of (NYSEARCA:USO) or (NYSEARCA:UCO) and place a tight stop below the lows on the 25th (Tuesday) From a derivatives standpoint, there isn’t any significant volatility in the above mentioned ETF’s at present so selling premium may not be the preferred choice. What one could do is use upcoming earnings in the likes of Chevron Corporation (NYSE:CVX) and Exxon Mobil Corporation(NYSE:XOM) and sell puts as volatility here is elevated and energy stocks should follow oil if crude has printed an intermediate bottom. This entry was posted in Oil and tagged Chevron Corporation (NYSE:CVX), uco, uso, xom. Bookmark the permalink.